Deadeyes Honor and Respect Ernie Pyle, who reported from Okinawa, where he was killed by enemy fire. Ernest Taylor "Ernie" Pyle (August 3, 1900 – April 18, 1945) was a Pulitzer Prize–winning American journalist, known for his columns for the Scripps-Howard newspaper chain, where he worked as a roving correspondent from 1935 through most of World War II. Prior to the war he traveled extensively throughout the United States, writing about out-of-the-way towns and their inhabitants in a distinctive, folksy style. After the U.S. entered World War II he reported from the home front and both the European and Pacific theatres, including actions in North Africa, Europe, and the Pacific. He was killed in combat on Iejima during the Battle of Okinawa. 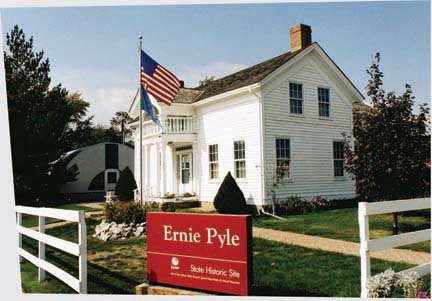 There is an incredible Video about Ernie Pyle on You Tube. The GI Joe video is embedded below. "In a column from Italy in 1944, Pyle proposed that combat soldiers be given “fight pay,” similar to an airman’s flight pay. In May of that year, Congress acted on Pyle’s suggestion, giving soldiers 50 percent extra pay for combat service, legislation nicknamed 'the Ernie Pyle Bill.” It added $10 extra to their pay. 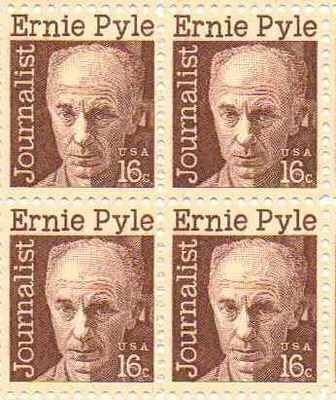 At Indiana University School of Journalism, Ernie Pyle is revered for his contributions to journalism and honored as the namesake of the building that houses an institution dedicated to teaching students what Pyle mastered: that great storytelling is built on great journalism skills and an ability to explain the larger issues of the world through the eyes of the people most affected by them. 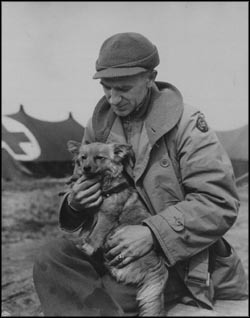 Click Here for Link to Photo of Ernie Pyle just after his death. This photograph was not discovered until sixty years after his death. This webpage explains the circumstances of his death. He was a WWII correspondent who won the Pulitzer Prize for his reporting from the front lines. He is credited for coining the term "dog-face" infantry soldiers. He was a well known and folksy style writer of stories of rural life and common individuals before he became famous. He was killed during the Battle of Okinawa on a battleground island Ie Jima. He was hit by enemy fire and killed instantly. His column, feathered by Scripts-Howard Newspaper chainwas syndicated by over 300 newspapers. 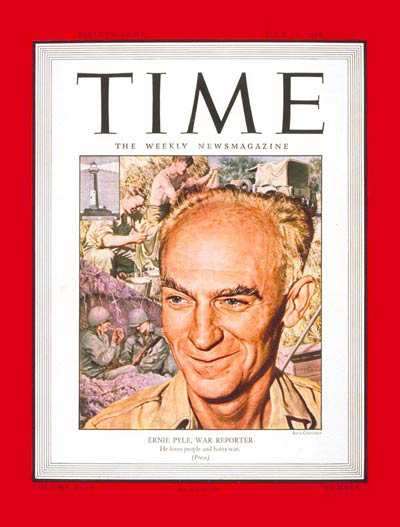 A well-known wartime correspondent, Ernie Pyle described World War II from the view of a foxhole on the front lines. On April 18, 1945, he was killed on a tiny island off Okinawa by enemy fire. Below is the Hollywood Movie posted on YouTube. 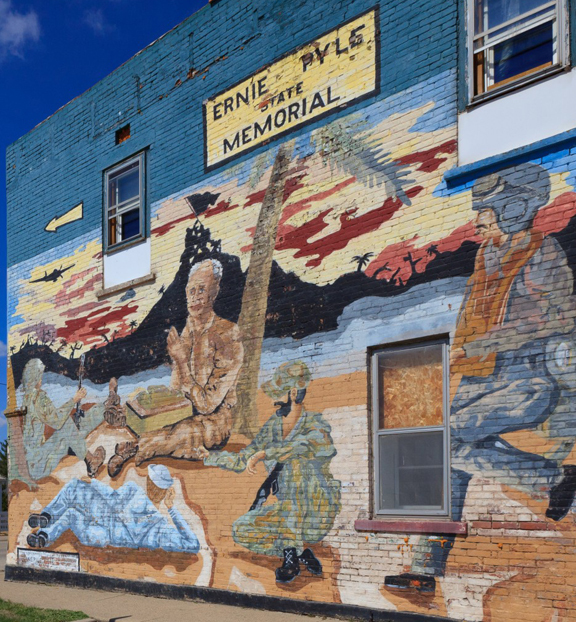 Ernie Pyle's Story of G.I. Joe: A 1945 American war film directed by William Wellman, starring Burgess Meredith who plays Ernie Pyle,and Robert Mitchum. The film was nominated for four Academy Awards.